“But they paid no attention and went off—one to his field, another to his business. The rest seized his servants, mistreated them and killed them. The king was enraged. He sent his army and destroyed those murderers and burned their city. Then he said to his servants, ‘The wedding banquet is ready, but those I invited did not deserve to come. So go to the street corners and invite to the banquet anyone you find.’ So the servants went out into the streets and gathered all the people they could find, the bad as well as the good, and the wedding hall was filled with guests. “But when the king came in to see the guests, he noticed a man there who was not wearing wedding clothes. 12 He asked, ‘How did you get in here without wedding clothes, friend?’ The man was speechless. When I heard these words, I experienced such a deep conviction in my spirit. Lord, how many times have I passed by the opportunity to share “words of life”, the Gospel of salvation through a personal relationship with Jesus Christ with someone who does not know Him? Have I been keen to remember Jesus’ command to go out and share the gospel, to be His ambassador to those in my own “kingdom of influence”? In response to my conviction I went to the Bible and read the parable of the wedding feast. 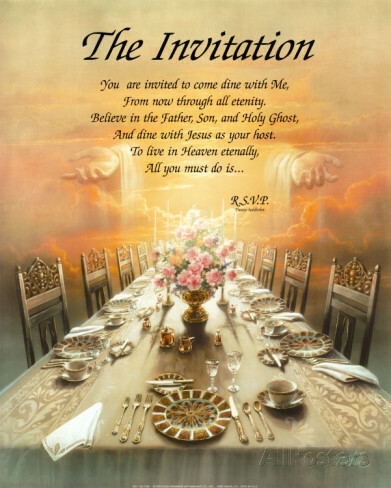 The King, Jesus Christ, invites everyone, every nation, every tongue, to life everlasting with Him…But is up to each and every one of us to accept the invitation. What stops us? I remember a story someone told me once. A group of musicians and a soloist singer were hired to perform at a wedding. The reception was to be held at the top of the Space Needle in Seattle, Washington, USA. There were size limitations for the party due to its venue, as the only way to get to the top was via a lift. All the musicians received an invite. The soloist singer was delighted to be included. But she got so caught up preparing for the wedding as well as attending to all her other engagements and performances, that she forgot to send her RSVP back for the reception. As followers of Christ, we are God’s ambassadors – He will ask us to be the messengers to deliver His invitation. We are not responsible for tracking the RSVPs, but we are going to be held accountable if God makes an opportunity for us to share the TRUTH with others and we shy away due to the personal cost to ourselves. So tonight, in writing this blog I am praying that God will show me how to share “words of life” with a friend , a stranger or even maybe someone reading this right now. God loves all of us so much that He sent His Son to pay the price for our sins – your sins, MY sins. Jesus laid down His life to that through belief in Him, we can be saved from death – spiritual death and separation from God for eternity. So hurry up – don’t be turned away from the King’s Wedding Banquet – RSVP YES – ASAP ! God's View vs. World View, Life Stories, Observations, What Is Truth? Thank you for all of your posts, and thank you for your comment on my 021814 post. May our Lord Jesus richly bless you.